Haramaki was originally part of samurai attire. In 16th century Japan the haramaki was a belly protector made of lined silk. The protector also contained chain mail or plates of iron. Today, the haramaki has made a fashion comeback. Checkout this review online. If you don't have time to stop by Japan, where can you find these things in the U.S.? DanielleDIY once had a selection (although she's backed up with orders so don't expect your haramaki for at least a month!) 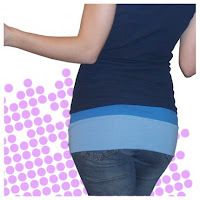 Stretchy, comfy, in pretty colors...hmmm...it might be worth the wait! Example A: I read a Chic&Charming blog entry. Note the red suede clutch and silk handbag. Almost a year later and I am still making jewelry for fun, buying bits and baubles here and there and always running out of brass chain when I need it. Example C: Just today I read a blog entry on the benefits of brining chicken. I haven't actually attempted this as of yet (I have no chicken on hand.) But if I did, that chicken would be sitting in a plastic baggie of salty/sugared water even as I type. Ah, the power of suggestion. Day 1: I arrive at home mid-day. Tired, no exhausted, but nothing too unusual. Day 2: Christmas Eve. I wake up feeling...off. Throat is a bit scratchy and I feel slightly...congested. By the time we put on our coats and head to a much anticipated Christmas Eve dinner at Sel de la Terre (insert, fabulous Provencal and Southern French country fare) I can no longer breathe through my nose, my eyes are dried out and crusty-feeling and my head feels like it is filled with jello. Day 3: Christmas Day. Having gotten very little sleep due to extreme sinus pain I wake up late, have a nice brunch with the fam, open presents (thanks for the slow-cooker!) and then take a nap. At dinner I can **almost** smell the gorgeous roast beef, but I suspect this could just be my imagination. It's now been 5 days and I am finally sinus-pain free. I can breathe through one nostril and have to say that a little R&R really does one good. Rather than go to lab on a particularly cold, wet, miserable day, I spent the afternoon watching Season 1 of the Gilmore Girls and knitting a hat, which I will never wear. 6 DVDs, 20 packets of Tylenol, 2 balls of yarn, and three chocolate bars later (well, just because you can't taste the chocolate doesn't mean you can't enjoy it!) I am feeling almost well enough to start up the New Year with a bang. It's a good thing I still have 3 more days to make a full recovery. For Christmas this year, one of my little decorative goodies included one of these cute matchbooks. 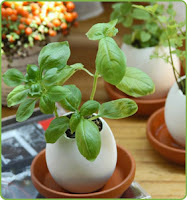 Tear out a matchstick, plant it tip first in damp soil and watch your flower or herb garden grow! Matchstick Garden comes in two varieties: mixed herbs or wildflowers. Each matchbook is 3" W x 2" H with 10 matchsticks. Easy to follow instructions are printed inside. Find them online at Brooklyn 5&10 or at a specialty shop near you! For each word you get right, 20 grains of rice are donated to the United Nations World Food Program. Who says procrastination can't help fight hunger? In Chinese, Zhen Zhen means "Precious" and what better name for one of the world's most adorable creatures. San Diego Zoo's newest panda cub was named on November 26, 2007 (naming traditionally happens 100 days after birth.) You can watch the little panda live on Panda Cam. When I first heard about the Giant Microbes (stuffed animals that look like tiny microbes a million times actual size) I thought to myself, "Well, that's creative!" I also could not believe people actually make money off such an idea. Yet, over the years, the company has expanded its repertoire. 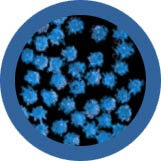 One can buy The Common Cold, The Flu, Sore Throat, a number of exotic disease microbes as well as some calamities. 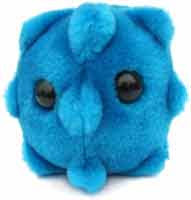 Imagine sending your boss a Black Death microbe or a plush Ebola! 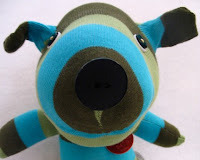 Our Chachkis Forest is home to a number of little critters: The Cough is a cute, yellow, rectangular shaped plush microbe, the Ear Ache is a pinkish double budded-looking organism and the Common Cold comes in bright blue. Despite being rather silly (in a nerdy kind of way), I have to say these little plush toys are terribly cute! They even come with a little informational card. Designed after their microscopic images and colored based upon their stain, these cuddly companions have made very friendly additions to our window sill. In the beginning, the Jade plant took over the window. And it grew without bounds; and darkness was upon the graduate students. And the plant towered over them, dropping leaves upon their faces. And the graduate students said, Let there be light: and they cut back the branches and there was light. ...And the graduate students said, let the Jade plant grow and let creatures that are random, toys that serve no purpose appear on the windowsill as well. And chachkis were collected, rearranged and piled upon one another, the Jade plant continued to grow: and it was so. And the Sunshine Buddy swayed its head, the eggling grew petunias, and the chachkis multiplied on the sill. Meet the inhabitants of the Chachkis Forest! Sunshine Buddies come in assorted friendly colors. 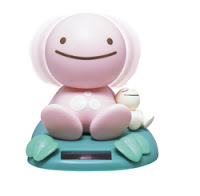 These little guys require no batteries as they are completely solar powered. Our Buddy sits on the windowsill beneath Mr. Prickly and has a relaxing swaying motion that keeps us calm and helps the plants grow. Over the years, my labmate and I have accumulated numerous plants at our desk window. In fact, we've begun to measure the course of our graduate degrees based upon the height and breadth of the 'monster plant,' otherwise known as Mr. Prickly. 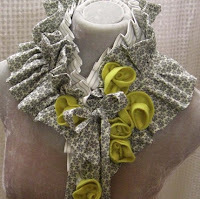 This season I have been obsessed with the ruffled scarf. There is something about having billows of soft, knit fabric about the neck. I am particularly infatuated with the expensive variety such as the Tidal Waves Scarf from Anthropologie. The cashmere waves are deliciously cozy and soft with just a little bit of stretch. Meanwhile I made up an easy topping of sauteed diced potato, onion and bell pepper. After the potatoes had cooked through I plopped a bit of polenta on a plate, topped it with the veggies and grated on some fresh parmesan cheese. A little salt and pepper and that was that. Eh. It was good but not fabulously exciting. Add berries, honey and lemon juice to a small saucepan. Simmer for a few minutes. I grilled up the leftover polenta on the George Foreman, poured on some berry compote and served it with a scoop of vanilla ice cream. YUM. The polenta was transformed. Not bad considering I'd just had more-or-less the same thing for dinner. Here's to the lazy cook in you! p.s. Breakfast will likely consist of grilled polenta topped with maple syrup and berry compote. Another good way to use up those leftovers! 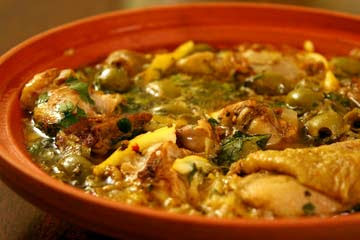 While on a trip through Morocco I consumed approximately 10-15 tagine meals. They were very delicious (my favorite was always the chicken tagine made with olives and preserved lemon), but by the end of our time abroad I was ready to come home and have a boring peanut butter and jelly sandwich just for variety. We did bring back a number of Moroccan spices, so when the mood strikes, I can attempt to replicate this delicious local specialty. Pat chicken pieces dry and coat with spice mixture. Let chicken marinate for one hour or more. In a skillet, heat olive oil on medium high. Add chicken pieces and brown on both sides. Lower heat to medium-low and add garlic and onions. Cover and let cook until onions soften and start to caramelize. Add lemon, olives and 1/2 cup water. Bring to a simmer then lower heat, cover and cook for another 30 minutes. Before serving, add fresh parsley and cilantro. Season with salt and pepper. Serve with harissa and couscous made with almonds and raisins. 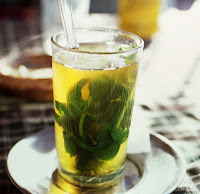 And of course, no Moroccan meal is complete without a cup of steaming hot, freshly brewed mint tea. Boil water. Pour a small amount in teapot and swish around to warm the pot. Combine the mint and green tea and sugar in the teapot, then fill it with the rest of the hot water. Let tea brew, stirring the leaves once or twice, for 3 minutes. Pour tea through a tea strainer into glass teacups to serve. Garnish with remianing 4 sprigs of mint. The name just makes the product sound fabulous, no? I intended to buy a Christmas gift for a friend, but an additional $35 meant a free gift and another $25 after that meant free shipping. Soon I had piled on far too many expensive beauty products for a single graduate student to fully appreciate. One of these ridiculous items was a tube of Dior Addict Ultra Gloss Reflect. 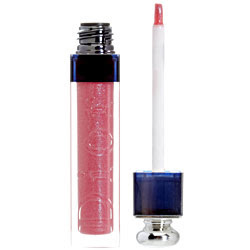 Marketed as the ultra-shimmering reformulation of Dior's cult-favorite, Dior Addict lip gloss, this stuff is meant to deliver a mega-watt shine and color that lasts for hours. Seeing as my usual lip coverage involves frequent applications of chapstick, I figured why not give it a go? A few days later I received a box in the mail. Wrapped in layers of tissue paper, amid a variety of free samples and encased in a gauzy drawstring bag was one very attractively packaged lipgloss. I tried it out immediately. Somewhat sticky upon initial application, it did work well on the lips and had a nice punch of sparkly (but not overpowering) color. It also lasted quite a while considering it was a lipgloss and I constantly reapply chapstick. I'm not truly convinced it's worth the $25 price tag, but I do love the color (Red Stockings 757)! Always remember to check online for discounts and free gifts with purchases! In search of a white elephant gift for this year's work holiday party I stopped by a small shop right in Central Square, Cambridge. 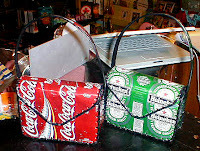 Buckaroo's Mercantile carries a fabulous array of random chachkis: religious paraphernalia from Mexico, sushi wind up toys, postcards of vintage trashy book covers...my favorite items are the handmade bags formed out of Coca Cola and Sprite cans. If you are looking for some fun stocking stuffers, this is the place to be! Buckaroo's is also available online! "It's Kevin!" chirped a cheerful voice. He didn't sound like a homeless guy, but you never know. Seeing as I didn't actually KNOW anyone by that name I figured he must be a neighbor who'd forgotten his keys. "Which apartment are you in?" Now I knew he was lying. I live in apartment 25. Probably drunk, maybe just confused, he must be related to my neighbor one floor up (see previous posting.) I really couldn't be bothered, so I switched off the buzzer, double checked the locks on my door and went back to watching TV on the couch. I showed up wasted at your apartment last night looking for a party. Rough. Sorry. I'll be there tonight if I get back from Roller Derby early enough. If he had only mentioned he was friends with my boyfriend, I would have let him in out of the cold. Although that would have been awkward, seeing as our holiday party wasn't until the next day. In 1939 when war with Germany was on the horizon, the British Government’s Ministry of Information commissioned a number of propaganda posters to be displayed throughout the country. The only graphic used was the crown of King George VI and it simply read, “Keep Calm and Carry On.” The poster was never officially issued and remained in storage until it was re-‘discovered’ over 50 years later in a pile of dusty old books bought at an auction. 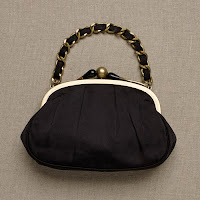 A fabulous carry on bag for the retro Brit in you! 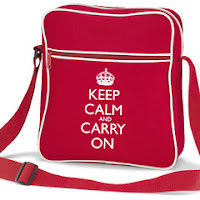 Find one at the Keep Calm and Carry On online shop! 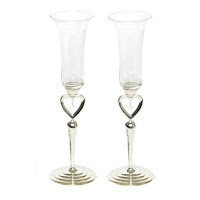 Add the pear brandy to your prettiest Champagne flute. Fill the rest of the glass with Prosecco. Drop in a cube of sugar and watch the fizzies bubble up the glass! Garnish with a slice of pear. The drink has a wonderful aroma, yet it's a deliciously dry, grown-up drink that will perfectly complement a dish of mixed nuts or a nice cheese plate. The sugar cube adds a festive touch - perfect for the holidays! For Christmas last year, my baby brother got me a very large bottle of Frangelico. He was rather furtive about it even though we are both above the age of 21 (some of us, well above) and giving gifts of alcohol is perfectly legal. But I digress...I happen to really like Frangelico, with its funny shaped bottle of a distinctly monkish form. In an effort to find a suitable use for this very delicious liquor I came across a timelessly classic drink: Spiked Hot Chocolate. Hazelnut+alchohol+chocolate. How can you go wrong? Warming and full of holiday cheer. Beat cream in medium bowl until peaks form. Add water to a medium saucepan and bring to a simmer. Gradually add cocoa, whisking until mixture is smooth. Gradually whisk in milk and bring to a simmer. Divide hot chocolate between two mugs. Stir 1-2 ounces of liqueur into each mug. Top each with dollop of whipped cream, then sprinkle with grated chocolate. Then I figured, why stop there? Taking the easy Devil's food cake recipe (see previous posting) I decided to add some Frangelico to the batter, the icing AND the accompanying whipped cream. A little sprinkling of cracked hazelnuts on top and voila, a chocolate Frangelico masterpiece! 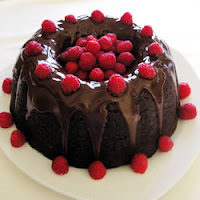 For those of you looking for a low-cal version of this dessert, you won't find it here. Although, I would recommend sticking with the hot chocolate sans-whipped cream because that's just too good to pass up! "Oh yah!" He remarked in thick Bostonian accent. "The broilah's been off since Satahday." Well, that would explain it. Fortunately, the broiler has since been repaired and the space heaters have been pumping out a steady supply of heat. Listening to the loud whistling sound of steam and roasting in the now sub-tropical temperatures of our apartment, we naturally had a craving for something warm to further enjoy the near-suffocatingly-warm moment. Add the rum, sugar, orange peel, cinnamon and spices to a mug. 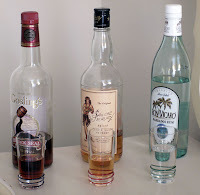 Heat the cider or water to the boiling point and pour into the spiced rum. Add a pat of butter and stir well. This would probably taste very good with a dollop of whipped cream on top. Then again, nearly everything would probably taste very good with a dollop of whipped cream. For some soft and gorgeous knitting material, stop by NORTH STAR ALPACAS. For every yarn product you'll see photos of the adorable Alpaca who so generously contributed his/her fiber. 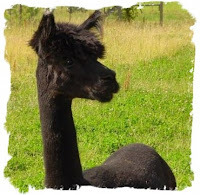 Maple has a herd of 10 alpacas along with a number of other furry and feathered animals. Buy something from her and you might get an email saying she’ll send off your purchase just as soon as she’s done with the morning chores. The yarn is hand spun, hand dyed and incredibly soft and warm to the touch. 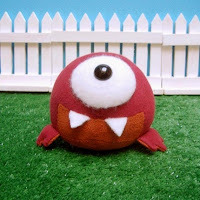 Make something fun and send a photo of your work for her blog site. I may be pushing my late twenties, but that doesn’t mean I can’t appreciate a cute plush animal when I see one! At Sweetestpea’s Fat Creations one can find all sorts of unique, loveable and fat critters. I love the funny, fat, one-eyed monsters named Albert. Described as “one of those guys who is always one step behind when it comes to jokes, he doesn’t get most of them and laughs right after everyone else. Just because he's a little slow, doesn't mean he isn't a good companion. He will always laugh at your jokes because he's afraid he'll be left out.” Aw...also in stock are a range of fat penguins, fat rice balls, fat hedgehogs and fat chicks. To see where Jen gets some of her inspiration, check out her hubby’s blog site! 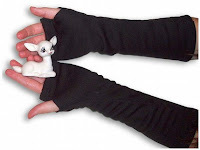 Staceyrebecca makes one-of-a-kind hand and finger puppets. 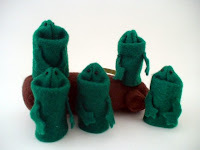 My favorite (of course) is the set of 5 green and speckled felt frogs that come with a speckled log. Also available are some more elaborate puppets with a very Sesame Street appeal. Give Jericho a good home and help a homeless pet! Be sure to check out the other editions of the Etsy Holiday Guide on Chic&Charming!!! And remember, etsy sellers require extra time for holiday shipping. 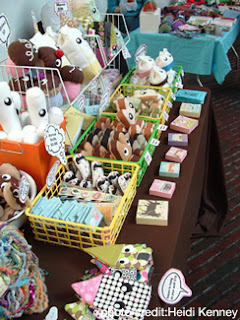 I've posted on SugarLips before, but I love her stuff so much I had to write about the shop again! 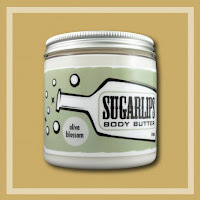 My favorite moisturizer by far is the vegan-friendly, ultra-creamy whipped body butter in olive blossom. While sitting in a lecture hall one of my classmates leaned over to remark on the subtle but lovely scent I was wearing. "No, olive blossom lotion from SugarLips!" I answered. TwinDreamsCreations is a sister team based in Michigan. They make fun glycerin soaps in all sorts of funky shapes. The fortune cookie shaped soaps have a fortune embedded inside of them that dissolves once it touches water. Other shapes include a purple octopus, bright fushia flowers and puzzle pieces! 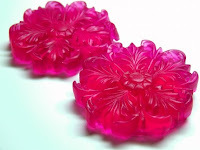 Since we're all in a lather, I should mention Karen's Soaps, another shop that specializes in fun glycerin shapes. Wouldn't this little rubber ducky make for a good stocking stuffer? Or perhaps the adorable fish-in-a-bag? Circular Accessories makes unique hand silkscreened clothing for men, women and children. Alison, the creator, works from Baton Rouge, LA. She's a mom and petowner with loads of silkscreening talent. 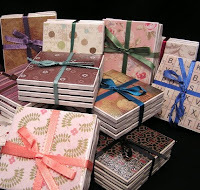 She prints everything herself using a table top press and can do custom orders upon request. Many of her pieces are done on American Apparel so items will be soft and comfortable the first time you wear them. 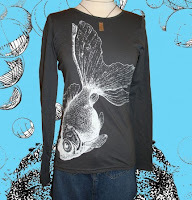 My favorite print is her giant goldfish, although she carries a variety of images from pirate ships to bumblebees! Looking for even more inspiration? She also keeps a blogsite of her favorite finds! For a little more high end design, check out bonzie. These items are romantic vintage and totally one-of-a-kind! 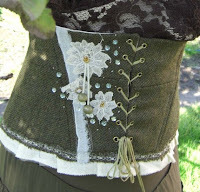 I adore the Irish Tweed Corset Belt and the Couture Victorian Ruffled Scarf. 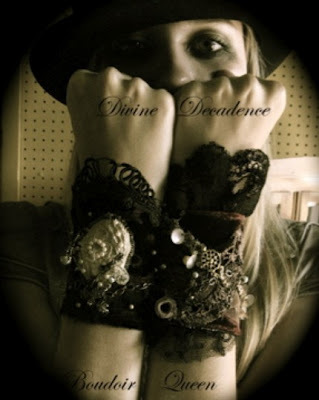 Every item is artfully constructed, with a "blend of neovictorian steampunk and deconstructed elements!" Although this might not fall strictly under the "clothing" heading of my blog entry, I have to mention Boudoir Queen. Creations by Dawn Younger-Smith have been featured in over twenty magazine publications including Elle magazine. 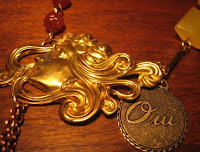 Using fabrics and trims from Paris she constructs gorgeous cuffs, neck ornaments, purses and other couture items. 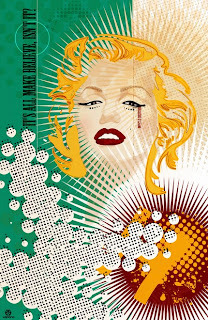 Her work has been worn by the likes of Patty Griffin, Molly Simms, Vanessa Paradis and Imogen Heap just to name a few. If you've ever wanted a fabulous pair of feathered knickers or an ostrich feather pillbox hat, here is the place to find it! Personally, I am partial to the line of decorative cuffs and gloves made of lace, velvet, French netting and vintage ribbons. For those of you who are New York based, check out this year's Bust Craftacular event, sponsored by Etsy. With over 200 vendors, (including one of my favs, pequitobun! ), DJs, dancing, food, and drinks, this will be an event not to be missed! Am Sedaris will be there, signing books and selling some of her own handmade goods. LOCATION: The Metropolitan Pavilion in New York City, 125 West 18th Street. 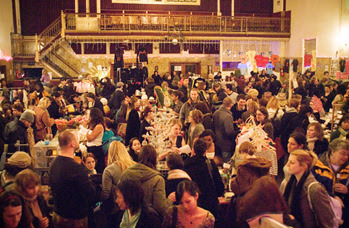 Then there is the Bazaar Bizarre...not your granny's craft fair. Dissatisfied with stencils of country ducks and painted wooden slices of watermelon, a hodge-podge of friends started the Bazaar Bizarre craft fair in Boston in 2001. Seven years later the event is still growing in popularity and has now spread to Los Angeles, Cleveland and San Francisco! I attended last year and had a ton of fun! One of my favorite homegoods designers is PataPri. Featuring linen kitchen towels hand silkscreened with all sorts of adorable and whimsical images, this shop is so much fun to browse! The colors are bright and cheerful with a fun and slightly retro feel. 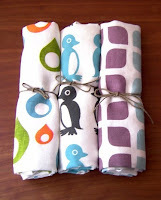 Choose towels covered with penguins, raindrops or funky modern patterns running up and down. Each design is limited to 100 prints so what you buy will be unique to your kitchen! The shop has been featured in DailyCandy! Go check it out! Another fun find is the littletilegnome, a shop that specializes in pretty tile coasters backed with cork. Tiles are decoupaged with a variety of patterns from her vast paper collection, then twice sealed with waterproof varnish to add shine and protection. I especially love the Retro Floral and Happy Hippie patterns. Sweet and functional! Who could resist? maryink silk screens cute aprons, clothing and votive candle holders. The green apron printed with Russian nesting dolls would be perfect for crafting or for cooking (two of my favorite activities!) 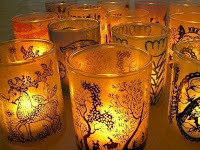 The pretty votives are silk screened and decopaged with all sorts of fun and funky patterns! When it comes to pottery, work by Kim Westad is unparalleled. 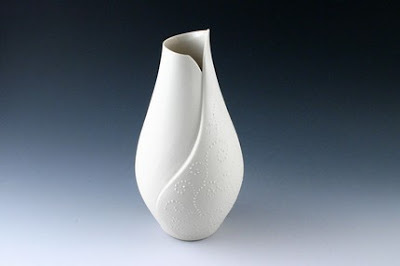 The creamy white ceramic pieces are smooth, elegant and pristine. Some items have a splash of color on the inside or outside while others have a sprinkling of individually applied pebble-like dots. Items have a beautiful, tactile quality that will add elegant beauty and drama to your home. 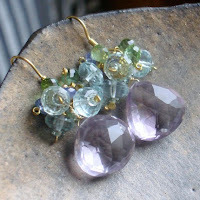 Kim Westad also has a website featuring more of her gorgeous work. Today's topic is ART. Check out Chic&Charming for more featured artists! First up is VEDANA. The striking images are raw and graphic. The powerful lines, forms and color are bold and in-your-face fantastic. Utilizing mixed media on canvas, VEDANA works to create gorgeous prints filled with intensely eye-popping oomph. 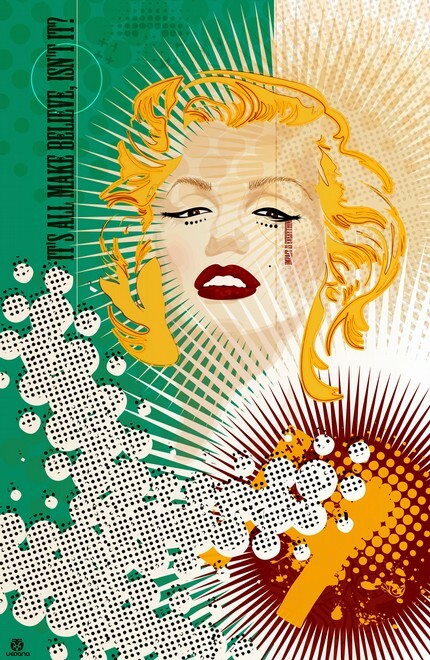 The vector illustration of Marilyn Monroe is brilliant and strong. 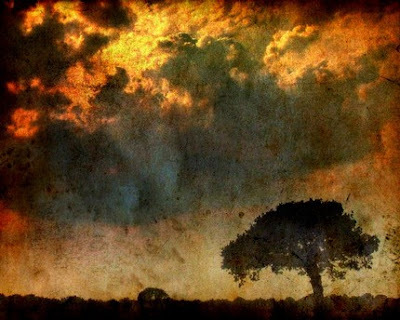 A classic image, reworked on canvas banner. The Bjork portrait is also quite sensational. 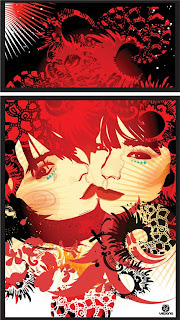 The image was done on paper then scanned and colored in a vector program. Each print is signed and some are limited edition. These are fabulous pieces to spice up a wall and add color and life to your world. So go find your favorite print and start your own art collection! The arm is still not great so unfortunately I can only tell you about a few of my favorites. 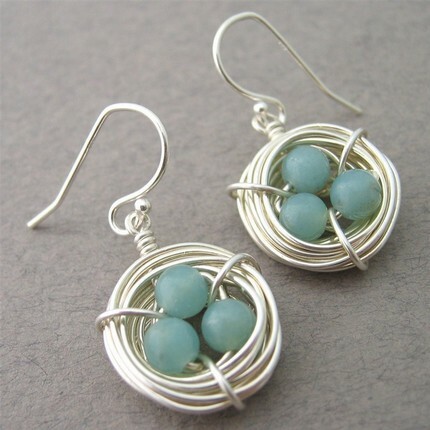 We'll start with starry designs, known for her adorable hand wrapped birds nest designs. I love the little Robins Nest Earrings with the sweet blue amazonite beads in a bed of silver wire. So darling! When it comes to glassworks, LingGlass delivers. She's from Singapore and is a stay-at-home mom who also sells on Etsy. 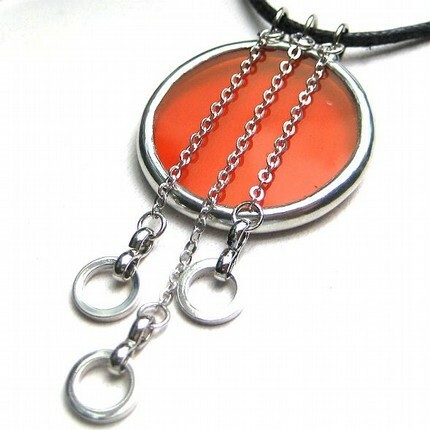 She's been working with glass jewelry for more than 10 years and is quite skilled with the soldering iron. She's also super-nice and friendly! Another great glass jewelry designer is Fiery Lion Designs. Caryn is based in Milwaukee, WI. 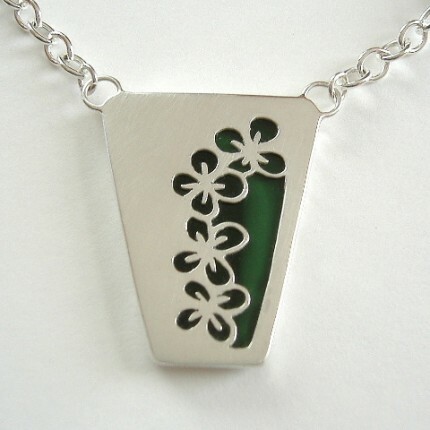 She's trained as a silversmith and has been making jewelry for the past 12 years. Her designs are simple, clean and perfect. My favorite item in her collection are the Irish Flowers set against a deep green glass backing. For something a little funky and kitchy cute, check out Imogen. 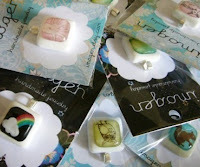 Aurora and her sister make adorable little pendants with fun prints and a resin topping. My favorite is her, "Hello, my name is..." line that might be available upon request. For metalsmiths, I turn to Stamp. Clare Stoker-Ring's designs are simple, understated and oh-so-elegant. She brings together, "the bright colors of her native Africa and the sparkle of city lights in her adopted home." 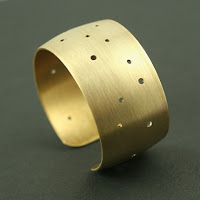 I love her Constellation Cuff with it's simple beautiful design. Also check out her Volcanic Blooms earrings, torch fired with red enamel and accented with fused 24kt gold. For some high-end fabulousness, check out the famous (and fabulous) 1ofmykind. These gorgeous pieces have graced the necks and ears of a number of celebrities, including, Fergie, Jessica Alba, Christine Lakin, Kelly Monaco, Tracey Edwards, Marissa Miller, Jolie Fisher and Anne Heche to name a few. The unique metal wrapping is a technique that adds a vintage and organic feel. For something high-end and classy, visit Passementerie. * a decoration or adornment. * ornate trimming of braid, cord, bead, etc. 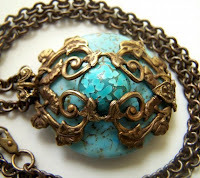 * a collection of artisan fine jewelry. All these pieces are made with gorgeous gemstones, beautiful sea pearls, sterling silver, and gold and platinum. Absolutely fabulous. Chic&Charming!!! And remember, etsy sellers require extra time for holiday shipping.